There’s no question the GigPig rules the roost in terms of small footprint. This is evident from a glance at a picture or one of the many video clips on YouTube. Just looking at it raises questions… Is it as portable as it would seem? Can such an unorthodox collection of drum heads on a box sound good? If it does sound good, does it sound good like good sounding drums, or good like something entirely different? What about the configuration? Can you get used to it if you’re accustomed to a more average setup? How’s the tuning range? 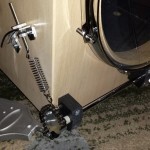 Is the “add-on” “floor-tom” required? What about quality, finish and durability? Are the pedals replaceable? 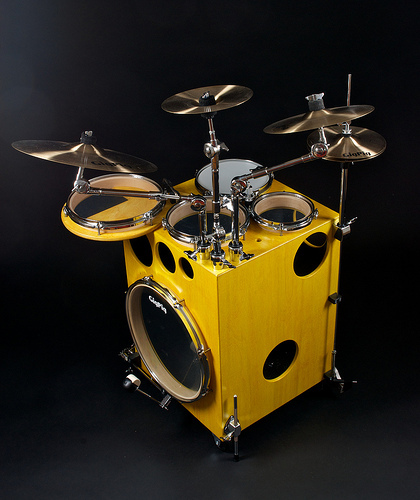 The GigPig was conceived in the mind of Swedish Drummer, Entrepreneur and Instrument Maker Kjell Andersson. 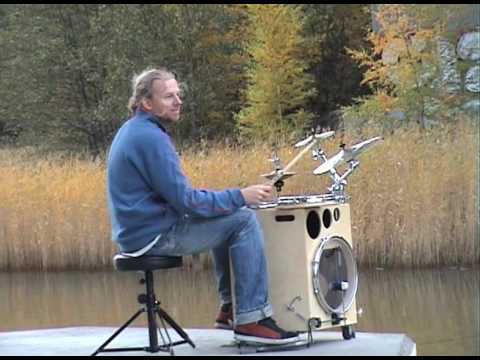 With musical roots as the drummer for Swedish experimental psychedelic “progg” band “Archimedes Badkar” (Bath-tub) and later as designer and maker of various instruments marketed and sold worldwide under his company name “Auris”. 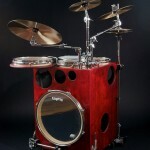 Viewers of CompactDrums.com will of course recognize the GigPig as possibly the most compact and portable drum kit on the market. 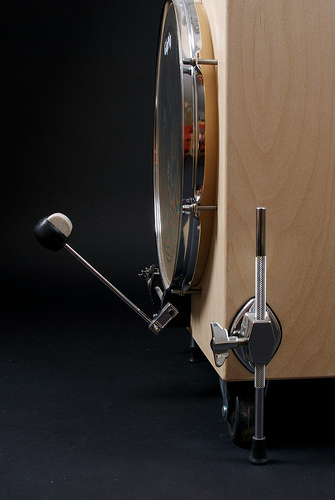 Kjell, however had an additional goal in mind for the design; to “streamline” the actual playing of drums by reducing the distance between them and placing them on the same plane. 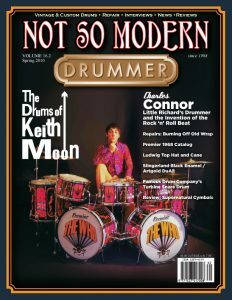 Indeed new grooves are naturally borne from rolling between the individual heads almost as effortlessly as on a single drum. The first generation of the GigPig saw the light in 2002, although earlier versions and prototypes pre-dated it. The current GigPig has undergone multiple improvements and re-designs to evolve into the instrument being hand-crafted in Sweden today. Once the contraption is out of the box and all the shrink-wrap and Styrofoam removed you’re faced with the laundry-machine-like item that’s somehow already familiar from various pictures and video clips. For some reason I thought it would appear different “in the flesh” but it’s exactly as pictured. Odd, square and different. 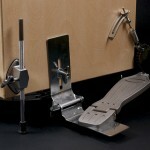 The two pedals are folded up on hinged brackets. 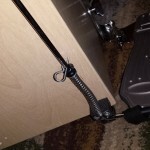 It stands on two casters and three adjustable, retractable legs. The heads are tuned to somewhat standard intervals out of the box. Although lower than my preference. The finish is also just like in the pics. It’s uniform and even but not perfect like musical instruments usually are. Rather it’s more utilitarian, like furniture. 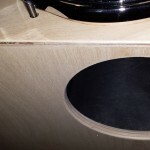 Our GigPig is natural finish, which appears to be a satin clear over birch plywood. Overall the GigPig gives a handmade, or maybe home-made impression as opposed to factory-made. Not surprising as it is hand-crafted in small quantities at a time. 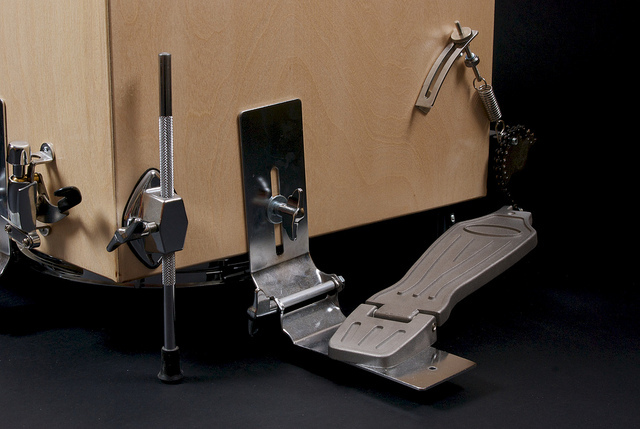 Some brackets such as the hinged pedal brackets are decidedly custom made for the GigPig. 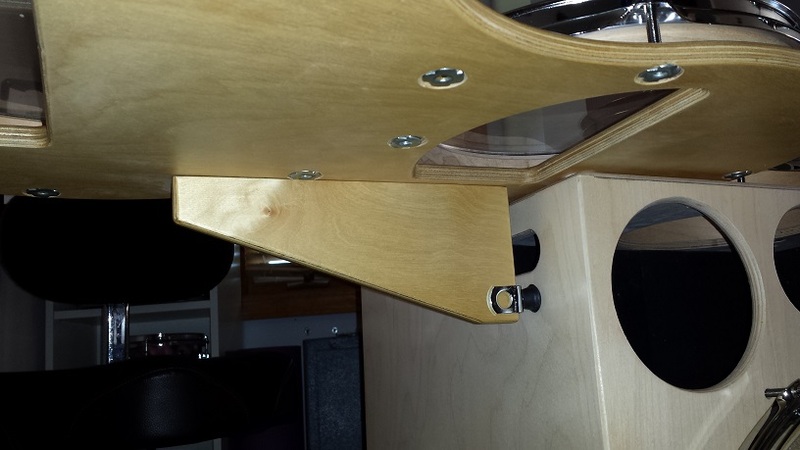 Most hardware, and tension rods attach to the main box with “Tee-nuts” pressed into the inside. My mind can’t help but wonder to Peter Lau’s innovations when standing in front of this interesting piece of percussive gear. Starting with the finish, I once read something to the effect that building construction is performed to the lowest finish expectations while furniture has higher demands and musical instruments to the highest expectations. 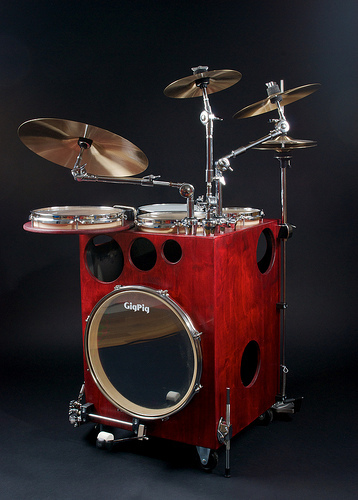 Following that example, the GigPig’s finish is more like furniture than what we expect from a drum kit or any other wooden instrument. It’s decidedly utilitarian. 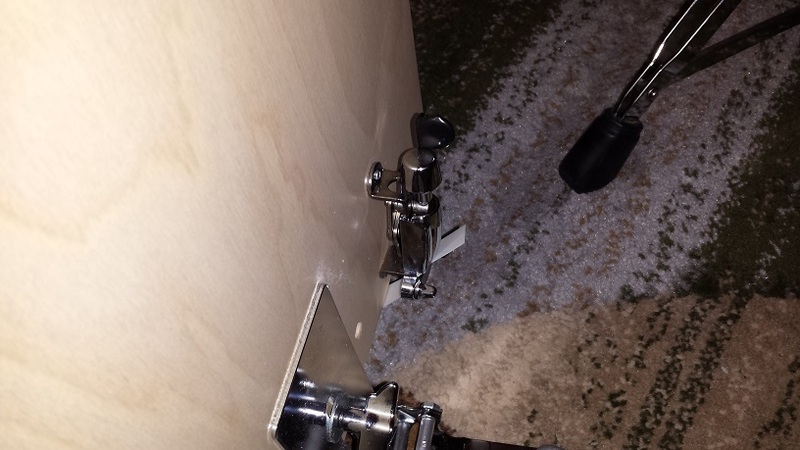 The plies of the wood are in full view in all corners and edges and the brackets that are made specifically for the GigPig look more like gate hinges than drum kit brackets. 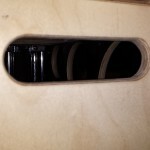 The inside edges of the “port holes” are semi-rough as are the interior of the chambers and bottom. The metal parts are of varying finish. Some of the chrome is mediocre, some is stellar, a few pieces have quite poor chrome plating. The parts themselves are also of varying grades. I would assume the parts are obtained from mixed sources and selected based more on function than form and finish. 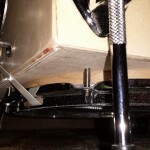 Both the HiHat “stand” and bass drum beater are a smidge on the “sticky” side out-of the box. A few days of constant jamming and a squirt of lube loosened it up nicely though. The bass drum linkage passes through two supports, similar to the support bearings for the drive-shaft of a rear-wheel drive car. I suspect the linking shaft will smoothen through these two supports with use. There is also a fair bit of adjustability to be had in regards to spring tension, spring angle and stroke length. 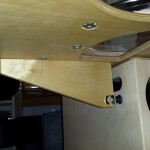 The shallow “shells” fit into grooves in the top of the “box” and are held in place by the tension of the head. 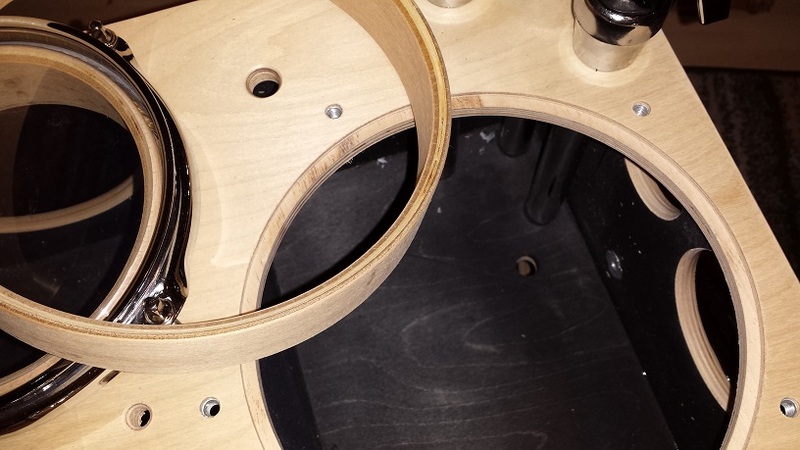 The bearing edges of all “shells” are straight and perfectly flat and square, but could do with a sanding. None of the shells are perfectly round but no more than 1-2 mm out of round, which is within the expected tolerances. The shells themselves are finished in a similar fashion as the main compartment. US $925 + US $340 for shipping to USA/Canada. It will also be necessary to add Duties as per your country’s tariffs. 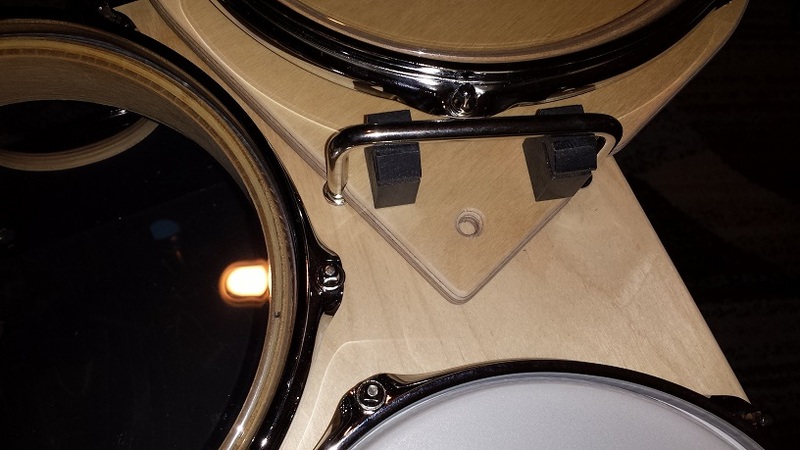 A 10″ + 12″ Add-on “floor tom” combo, also reviewed is available for US $190. Maybe this section seems almost redundant. However it wouldn’t be a complete GigPig review without some notes on how it performs at what it’s obviously engineered for. The only limit in regards to portability are the dimensions noted in the right column. 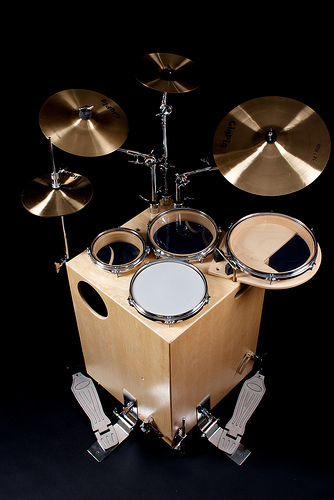 If you have this space in your car, the GigPig is as portable as a set of drums will get. 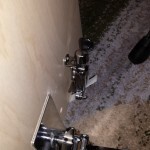 It can be rolled on the two casters like a dolly, or carried by holding one of the port holes and a handy little carry-handle on the opposite side. Setup and teardown are both fast and straight forward. 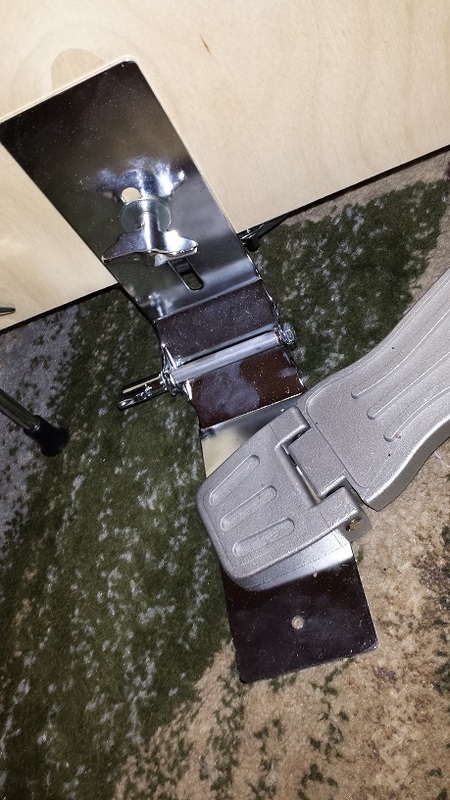 The pedals simply fold up and down on their hinged brackets and lock in either position and the legs retract just like floor tom legs. The add-on tom simply snaps into, and out of place. All that remains are the beater and the HiHat rod and cymbal arms. Funny enough, none of these come with memory locks. Had it come with a full set of memory locks I would have given it a 10/10. The main enclosure of the GigPig feels solid and well put together. The overall design doesn’t leave any section of the box vulnerable. The internal walls between chambers also act as reinforcement for the overall structure. As such the main enclosure is likely to last a life time. Some of the external metal parts are of high quality and/or positioned in protected areas. 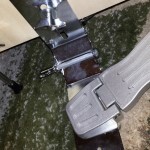 Other parts like the pedals and their hinged brackets, portions of the bass pedal linkage and certainly the HiHat rod, look far more fragile, in addition to being positioned in exposed areas. 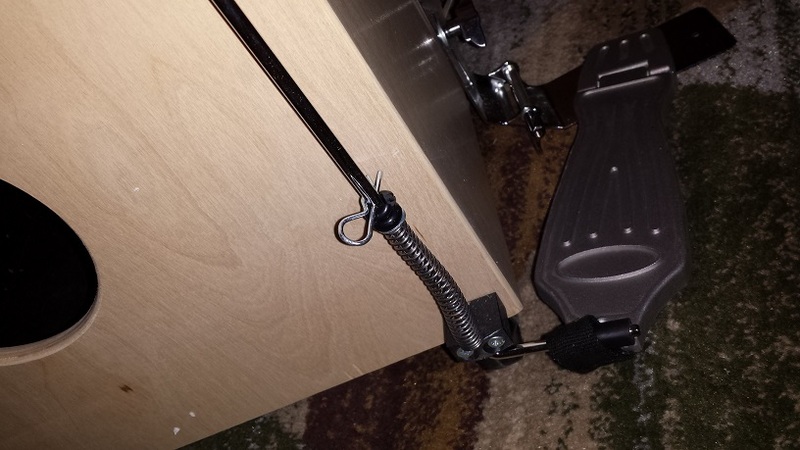 The snare strainer is attached on the outside of the box, near the floor just waiting to get kicked, banged against a car door or whacked against other gear. Since the GigPig’s intention is to be lugged around and gigged I would fully expect to repair, improve and replace these parts at some point. A couple of the most important parts, the rims and the heads, are on the other hand of very nice quality. The rims are all 2.2 or 2.3 mm and the unbranded heads are of better quality than heads usually included with a drum kit. 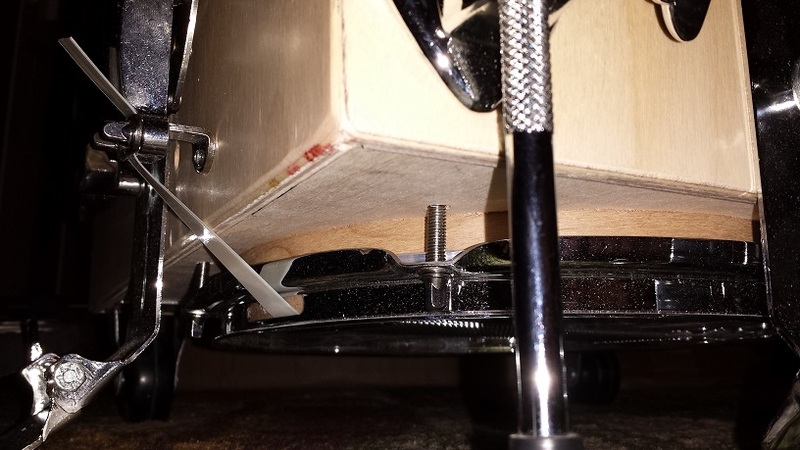 Hi Hat tension is adjustable with three positions for the spring retaining clip. 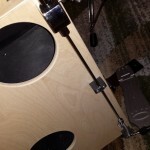 The backwards action bass drum beater allows for placing the entire kit between the knees while providing the audience with a view of the bass drum action. The Portability section seemed redundant due to the expectation that there simply isn’t another set of drums that can compete with the GigPig in that respect. One would expect such a high level of portability to come at the cost of sound. 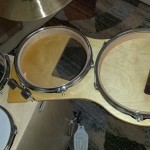 I mean we’re looking at a plywood box with rather small size drum heads attached to it. Personally I would have deemed it necessary to mic it under all circumstances, both for volume and to be able to manipulate the sound. Here’s where the GigPig surprises, and by surprises I mean shocks, as in; “Pinch me, I’m dreaming”. There are some mysterious forces in effect with the GigPig. What looks like randomly placed and sized holes, presumably for visual and carrying purposes, I’m now thinking are carefully engineered porting vents. 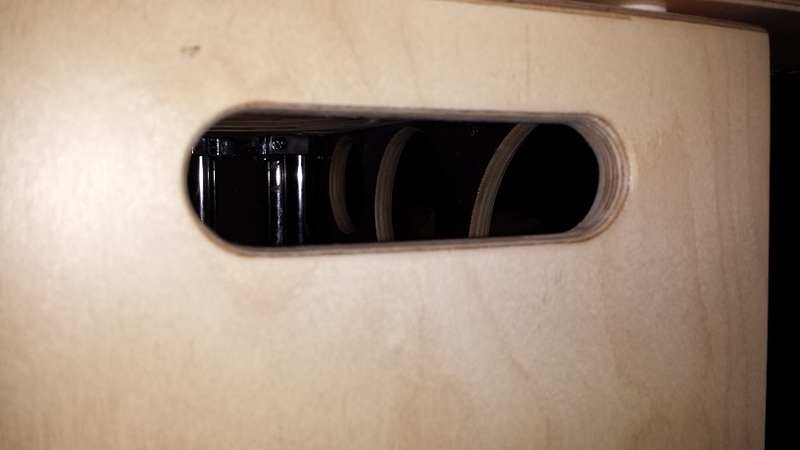 I would also guess that there is a fair bit of engineering involved in the sizing of the various chambers that divide the GigPig internally into individual drums. I don’t know how else to explain the contradiction between what my eyes see and my ears hear. Starting with the bass drum. As expected without a resonant head, and with a dual ply, hydraulic batter head, the sound is tight and punchy. No pillows or other damping needed. What isn’t expected is the loud, deep and overall “big” sound that comes out from the guts of the GigPig when stomping the bass pedal. As expected the little 14″ bass drum is best tuned low, just a bit past loose, but sounds surprisingly good tuned higher too. Throughout the tuning range it sounds like a bass drum, a full size bass drum at that. 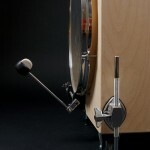 The snare drum is equally impressive but a little easier to understand. There’s a reason the strainer is all the way down by the floor. The snare drum is that deep. The bottom head is under the main box. Thus it’s not as shocking that it sounds big. It’s tuning range is a bit limited and I wasn’t able to get a real snappy crack out of it, but the growl and clean, crisp, neutral snare sound is pure and pleasant. Rim shots are a joy as well. 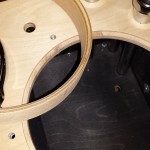 Somehow whacking the rim resonates through the shallow shell and down into the big box itself, yielding far more powerful rim shots than a regular snare drum. 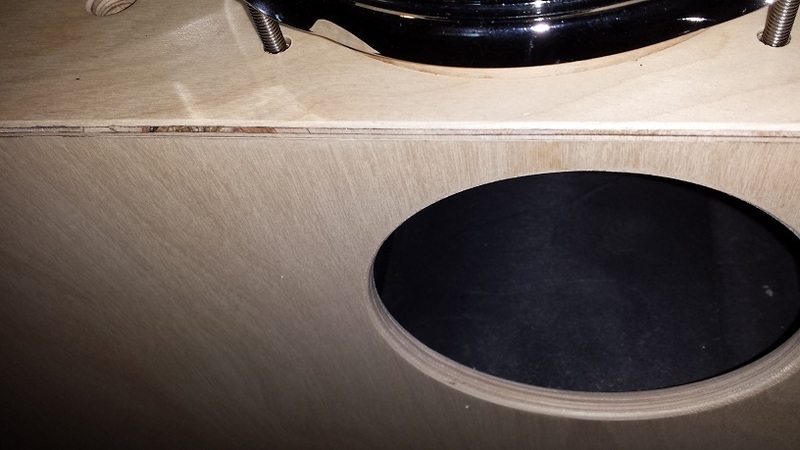 Equally impressive is the 8″ tom, with a sneaky ability to emulate a 10″ or even a 12″ tom with careful tuning. The only lacking being in the sustain and resonance department. 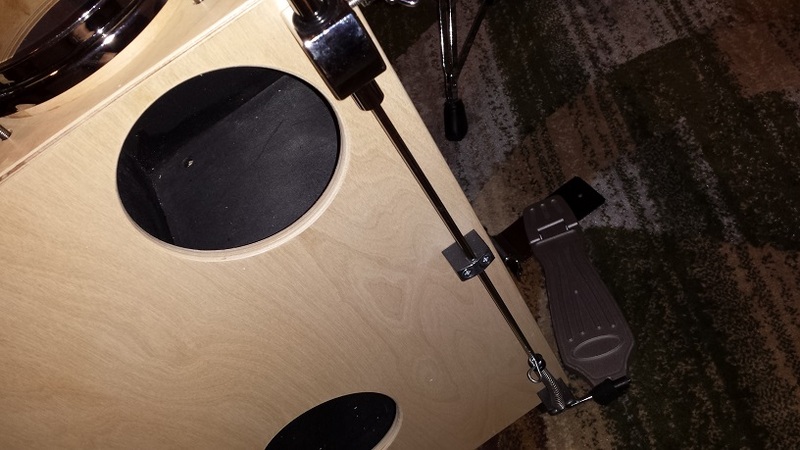 Even the 10″ “floor tom” surprises with a far bigger sound than the shallow little 10 would suggest. This I have no explanation for, but I sure do like it. 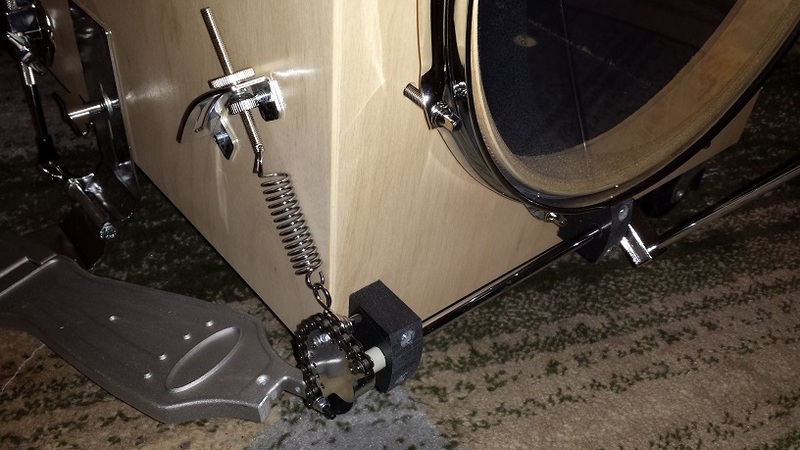 For this GigPig review, we tested a few variations in tuning. 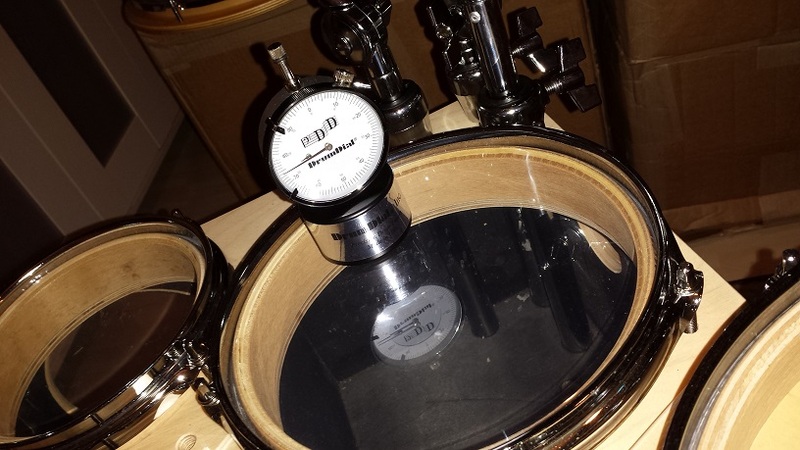 Tuning the entire kit with the DrumDial to recommended tensions yielded better results than simply tuning it by ear. Using the DrumDial to tune the GigPig consistently to each drum head’s sweetspot had us all fighting for our turns to play. Further tweaking the intervals had us in drumming Nirvana. 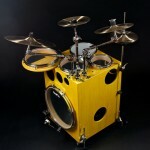 Yes, we have other drum kits here at CompactDrums.com that sound that great. In comparison the Taye GoKit does in all honesty sound a lot better overall than the GigPig, but the GigPig has the shock factor of the great sound coming from… well… a big box. Check the sound sample videos here. Even the cymbal pack is surprisingly OK sounding compared to their appearance. 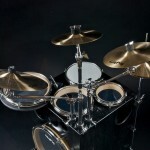 The color tone, weight and finish look similar to cymbals that are included with entry level drum kits. However they sound far better and are perfectly matched with each other. I don’t mean well matched, I mean absolutely perfectly matched. 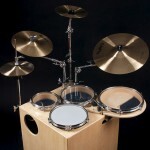 At US $175, the cymbal set is a surprisingly good value. 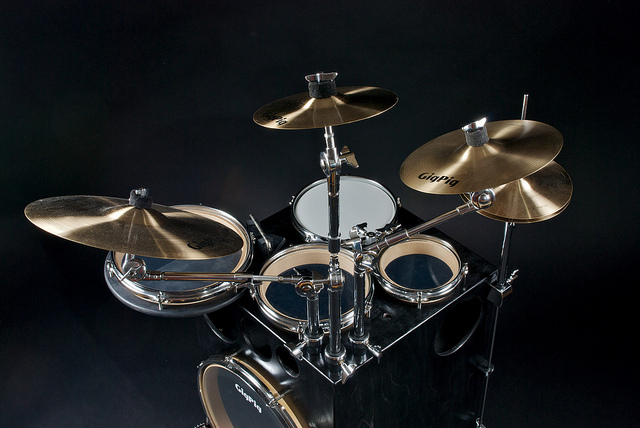 With a price just north of US $1,200 without cymbals, the GigPig isn’t the first choice for the budget minded. 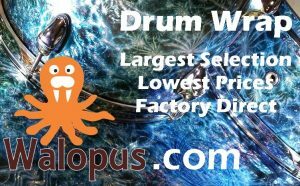 Many compact drum kits can be had for less than half the cost. However, there isn’t another option that rivals the GigPig in terms of footprint. 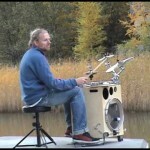 While some other compact kits may come close in transportability, the GigPig is also unbeatable in “local” portability. By local I mean for example wheeling it around to different locations on a cruiseship, resort or conference. The super compact GigPig also manages to spank some of the competition in sound. Although I wouldn’t go as far as claiming it can rival competitors in the same price range, sound-wise. While neither the finish, quality, durability or even the sound justifies a $1,200 price tag, the true value of the GigPig is in it’s unrivalled footprint and portability. Whether those factors can warrant the price tag is for you to decide. For me personally, I’m handy enough to consider the DIY-kit offered at approximately 30% lower than the fully assembled GigPig. 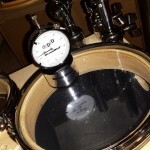 Look for a detailed feature article on the GigPig DIY-kit coming in the near future. 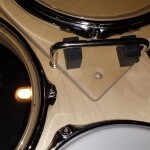 Another option to the 10″ Add-on “floor-tom” is the double 10″ & 12″ “Connect-able” tom. The “snap-on” attachment makes it quick to add or detach as needed and like the 10″, sounds better, and bigger than it looks. Unfortunately the one that shipped with our GigPig didn’t quite match the finish resulting in a slightly odd two-tone effect. 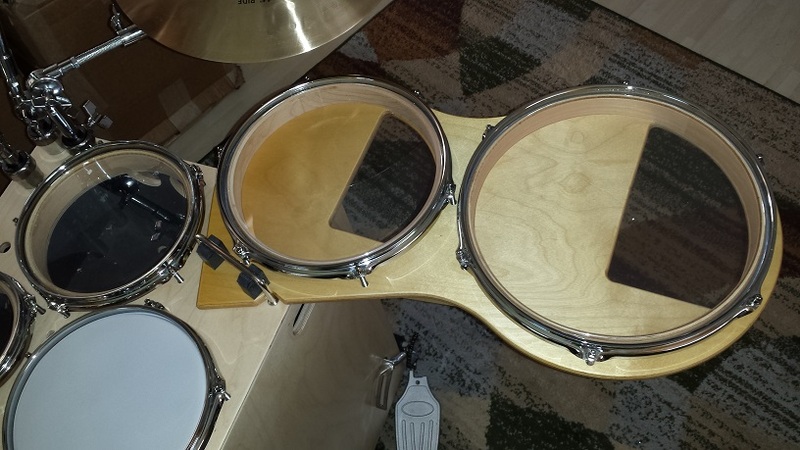 We played the GigPig without add-on, and with both single and double add-on toms. Personally I like just the 10″, Derek preferred the double and Todd enjoyed it the most with no add-on at all. It’s taken a few days for the GigPig to grow on me. While reviewing, inspecting, tuning and measuring some drum kits I frequently take breaks to just enjoy playing. With the GigPig this didn’t happen much in the beginning, but the more I get used to it, the more I enjoy just jamming on the “Pig”. I also really like the way it looks in the corner of the living room, taking up about half the space of a regular four-piece Jungle kit while defying what a set of drums should look like. 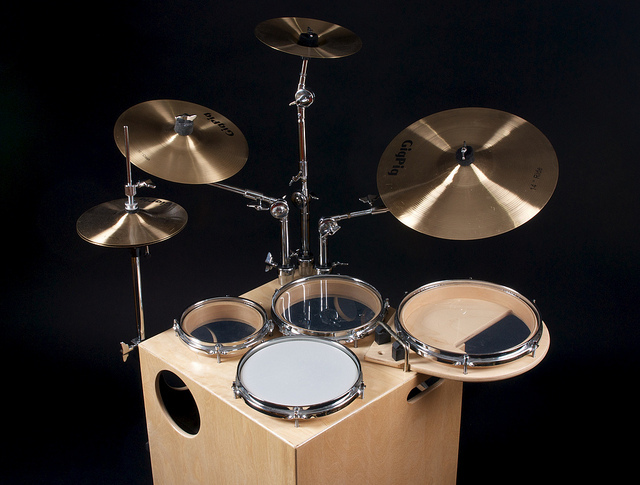 Gigging the GigPig would likely prove a lot of fun as even slightly different drum kits get immediate attention. The GigPig would likely steal the show. If you’re a single drummer it would make a great “wing-man”. 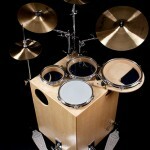 Personally I can appreciate the “Function-over-form” approach, which for me justifies the un-drum-kit-like finish. The GigPig is packed with well thought through design and construction solutions that add up to a work of art in the functional department. For the folks that crave gleaming clear coat, sparkly surfaces and lustrous chrome however, the GigPig won’t excite visually. In the end it comes down to a personal decision whether the somewhat hefty price tag can be justified with the unique practicality, hand-crafted personality and unexpected sound quality of the GigPig.